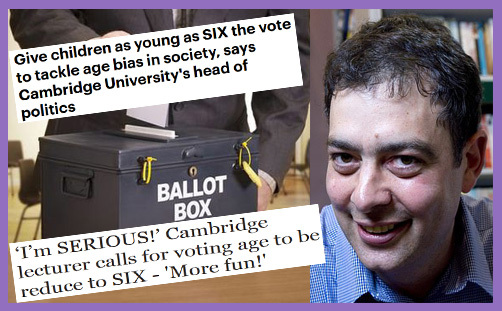 Prof David Runciman (Cambridge University) is of the view that an ageing population is creating a democratic crisis: the views of those beneath the age of 18 – the current legal voting age – are thoroughly quashed by those who get to vote right into their dotage, even if they should develop dementia. The principle of ‘one person one vote’ is exactly as it should be, Professor Runciman says, but, clearly, if adults who still think they’re voting for Margaret Thatcher continue to have a say in elections, why shouldn’t six-year-olds? “Old people are currently the coalition that have a huge inbuilt advantage in representative democratic politics,” he observes, lamenting that Vote Leave won the EU Referendum, and Jeremy Corbyn didn’t win the 2016 General Election. Presumably that excludes those destined to be aborted. I would lower the voting age to six, not 16. And I’m serious about that. I would want people who vote to be able to read, so I would exclude reception [age-children]. What’s the worst that could happen? At least it would be exciting, it would make elections more fun. It is never going to happen in a million years but as a way of capturing just how structurally unbalanced our democracies have become, seriously, why not? Why not six-year-olds? As one might expect, Professor Runciman has been much mocked and derided for advancing such an absurd proposition. The Daily Mail‘s and Express‘s upper-case ‘SIX’ trumpets their dismay. But might he not be on to something? God has displayed the doctrine of ‘common grace’ through three main social institutions – the Church, the State, and the family. In free nations they permit the expression of individual conscience, the encouragement of good and the restraining of evil, enabling civil structure and social order to operate. There is always room for improvement within democratic structures, especially when it comes to the need to remedy what Professor Runciman calls “structural imbalance” or bias which might cause or perpetuate democratic injustice. So perhaps lowering the voting age to six doesn’t go far enough (this appears to be an arbitrary threshold at which the Professor believes children can generally read [but not understand?]). How about universal suffrage? How about voting from birth? Votes obviously wouldn’t be cast by mewling and puking infants, or by toddlers, or by six-year-olds who might be able to read Wonky Donkey or The Cat in the Hat. They would instead be exercised by the parents during the voters’ years of minority. It would still be ‘one person one vote’, but personhood would be recognised from the moment of birth. This would be a natural extension of the principle of equality, and give the family a justifiably higher electoral status. Democracy would thereby be improved, and a crucial unit of society – the foundational unit of society – would have the power to participate in determining its own development and future. This would be wholly consistent with the Christian view of the family unit, which currently makes no representation at all to the State (and, indeed, against which the State has incrementally militated in welfare provision and taxation). It might make for all sorts on interesting family discussions (or arguments) as the children grow older: demanding that a parent cast a proxy vote for a 16-year-old which might not be in accordance with the desires of that child (as they still would be) would doubtless lead to all sorts of “I hate you” door-slamming, with cries of “That’s so unfair!” and “I wish I’d never been born!” storming out of the house. But if parents are able to cast votes in proportion to the size of their family – on a scale which reflects their personal and sacrificial investment in the future – might this not be a means of halting the modern madness of social experimentation which risks the destruction of the family and will ultimately cause great damage to society? The family was God’s first and most important social institution. There is no more important a task than rearing the young and teaching them how to live with other members of their own family and then to participate in society. Why not apportion votes to reflect this, and thereby inculcate them into democratic participation?